Salt suppliers, experts quell snow removal contractors’ concerns over what appeared to be a salt shortage this winter. Case Snow Management staff made a 16-hour round trip to Maine to pick up an order of rock salt this winter. All the while, there were piles upon piles of the deicer at the company’s local supplier, right down the road from its headquarters in Attleboro Falls, Mass. His viewpoint aligns with what many experts and suppliers say created an apparent salt shortage this winter. Lori Roman, president of the Salt Institute, confirms there is a sufficient amount of salt available for mining, and it was being mined this winter. The problem was the severe winter increased the demand for ice melts, and the extreme cold that came with it affected suppliers’ transportation methods for those products. “The modes of transportation we used were challenged by the same weather causing the demand,” says Mark Klein, director of communication at Cargill. For example, the supplier has salt mines in Lansing, N.Y., Cleveland (photo above) and Avery Island, La. The latter generally transports product on barges up the Mississippi River—these vessels can move the equivalent of 15 rail cars or 60 to 70 tractor-trailers, Klein says. The cold froze parts of the river, though, requiring the supplier to resort to ground transportation, which held equal challenges. Rail cars had to travel at slower speeds to be cautious of the cold’s effect on the air brakes, Klein says, and, when transporting by truck, Cargill faced the same winter roadway conditions as commuters. Martin Tirado, CEO of the Snow & Ice Management Association (SIMA), says this isn’t the first time the industry has encountered a “supply and demand issue” thanks to severe weather. He recalls a similar situation in the 2008-2009 winter and says it happens every four to five years. What added to the dilemma this year, Tirado says, is contractors had no notion there would be extreme snowfall, given they prepare for average winters. Because there were relatively mild winters for the past two years, contractors underestimated how much salt to order at the start of the season. 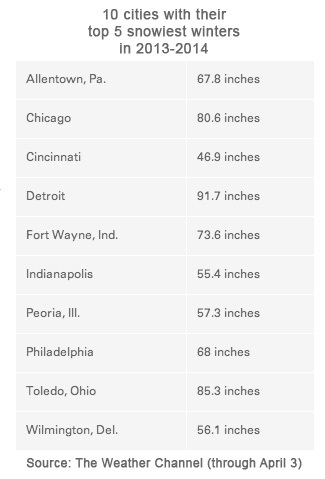 In addition to the high precipitation, states like Wisconsin, Michigan, Minnesota, Iowa, Indiana, Illinois and Missouri registered a top 10 coldest winter for the 2013-2014 season, according to the National Oceanic and Atmospheric Administration (NOAA). Statistics like that caused the high demand for salt. Case, for instance, used 50 percent more salt than average winters past, albeit the company also grew 25 percent more than last year, Glatt says. To compensate, Cargill’s salt miners worked up to 60 hours per week (compared to last year’s 32 hours per week), Klein says. The company quickly used up its excess supply from last season. The result of that overtime covered only the company’s orders for contract-holding customers, though. And many of those contracts have maximums, meaning clients may receive 20 percent to 30 percent more product than originally agreed upon and at the same price. Halfway through the winter, most customers already were into their maximums, Klein says, leaving little else for contractors looking to buy as they go. Suppliers, like Cargill, are obligated to fulfill the orders of contract-holding clients before other customers. And some suppliers give government contracts precedence over private contracts because it’s viewed as a public safety issue. Those scenarios left contractors like Glatt and Shayne Newman, president of YardApes, on the outs of receiving rock salt when it was sitting right in front of them. Newman faced like challenges, saying at one point he called every supplier within 100 miles of the New Milford, Conn.-based company just to find none had rock salt or none available to customers without contracts. Newman got creative in obtaining some product when a supply store a quarter mile from his office limited contractors to purchasing only five bags of salt until further notice. He sent different employees to the store and provided them with cash instead of the company credit card so they would appear to be purchasing five bags for a separate company each time. Seeing both sides of the problem was Dan Degan. He is co-founder of SharkMarx, an eBay- or Priceline-like buying platform that operates as a “reverse auction.” Contractors submit requests for products and dealers/distributors offer bids on their requests. Degan acted as the middleman this winter between disgruntled contractors hunting for deicers and suppliers (dealers/distributors) who were mum about having nothing to provide. Come December few dealers were bidding on ice melt requests on the site. That raised a red flag to Degan and his business partner—as did the contractors communicating their concerns and “sheer panic” to the company if they didn’t get their hands on ice melt. “They were worried about slip-and-falls,” Degan says. SharkMarx dialed suppliers from the East Coast to some in Montana in search of ice melt. It eventually found some in Utah and Tennessee and facilitated the delivery process, subcontracting a trucking company to transport the product to customers. The longest delivery was from Salt Lake City to Worcester, Mass. The majority of transactions were bags of deicing blends and calcium chloride, Degan says. He adds contractors were paying 68 percent more than average for those when they became available on the website. Tirado also saw price spikes. For next year, Degan is encouraging contractors and dealers to communicate about ice melt earlier, suggesting getting those orders in place between June and August. Stockpiling is the topmost advice experts offer to prepare for severe winters. The Salt Institute encourages having one year’s worth of salt stockpiled before the snow starts to fall. “That means some of these private contractors may want to consider how they can store it properly, making sure they keep a supply under cover so it doesn’t get into the elements and that it’s stored on a concrete pad so it’s not going into the soil,” Roman says. Yet, the challenge to stockpiling is it takes a financial investment and requires storage space. He adds larger companies have the space to bulk up stockpiles, whereas smaller companies rely on suppliers to store the product until they need to purchase it. Still, companies with stockpiles suffered this year, and Case was one of them. The company aims to have a two-week supply on hand at all times. At one point it stretched that excess for three and half weeks, doing so by scaling back its pretreatments and only applying salt to high-traffic areas. To stretch supply, Tirado suggests treating only high-traffic areas of a property, too, such as the main drag of a parking lot or building entryways. He also advises to use liquid applications as a pre-wet on a current salt inventory so it lasts longer. He notes it’s important to educate employees on application rates so they know not to over apply (see sidebar). “It’s always a capacity-balancing game,” Glatt says. Some of Case’s contracts prohibit it to raise customers’ prices due to market issues. And for that reason it “absorbed some of the hit” from the shortage, paying out of pocket for the additional transportation costs to get salt. YardApes doesn’t stockpile, so it relied on customer communication and rationing to fulfill its contracts. The company notified clients of the salt shortage and said only high-traffic areas would be treated for the time being. It rationed the amount of salt it had by creating a sand/salt mix to provide traction to properties versus melting the ice. While for the most part customers were considerate of the situation, Newman says it has made him consider putting a clause in his contracts that the company isn’t liable for slip-and-falls if the industry is in a salt shortage. Here are a few things to make sure employees understand about salt spreading, according to Martin Tirado, SIMA CEO. The effectiveness of rock salt depending on temperature and surfaces. Identifying high-traffic areas on a property site map. When it’s appropriate to use alternative methods such as pre-wetting a salt supply or applying abrasives like sand. Former Associate Editor Sarah Pfledderer is a West Coast-based contributing editor for Landscape Management. 1 Comment on "Snow, salt experts opine on the salt dilemma"
Whoa. 16 hour round trip from Mass. to Maine? Walking, maybe.